February 1995 – Ph.D, Topic: Myocardial scintigraphic study with I-123 MIBG for the assessment of cardiotoxicity – neurotoxicity of Doxorubicin. Member of Hellenic Society of Nuclear Medicine & Molecular Imaging. 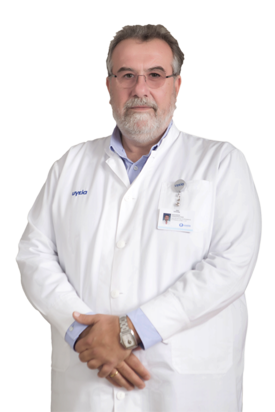 Member of E.A.N.M (European Association of Nuclear Medicine). Member of ASNC (American Society of Nuclear Cardiology). Member of SNM (Society of Nuclear Medicine). Award to the presentation “The contribution of myocardial scintigraphy with antimyosin in the diagnosis of acute myocarditis” at the 20th Panhellenic Medical Congress. Journal of Nuclear Cardiology Jan/Feb 1999,Vol.6 No.1Part 2:S5. Award to the presentation: THE EFFECTS OF LONG-TERM RIGHT VENTRICULAR APICAL PACING ON CARDIAC SYMPATHETIC INNERVATION : AN 1-123-METAIODOBENZYLGUANIDINE (MIBG) SCINTIGRAPHIC STUDY as the best announcement with basic research theme from the Hellenic Cardiology Society Athens, 3 March 2000. Award to the presentation “Scintimammography in diagnosis of breast cancer” at the 7th Panhellenic Congress of Mastology 16-19 March Athens Greece. Award to the presentation PET/CT in the estimation of single lung nodule.The role of late images with18F-FDG at the 3d Panhellenic Congress of Oncology Imaging 13-15 December 2013. Award to the presentation The contribution of PET/CT in the evaluation of response to immunotherapy with Rituximab-CHOP in primary mediastinal B cell lymphoma. Clinical results. 23th Panhellenic Congress of Hematology 2012. Springer: “Imaging in clinical oncology”.V. Prassopoulos: “PET/CT Clinical Implication of the Role of 18FDG-PET/CT in Malignant Lymphomas” (pp 249, part V). PET/CT in primary mediastinal large B-cell lymphoma responding to rituximab-CHOP: An analysis of 106 patients regarding prognostic significance and implications for subsequent radiotherapy. Leukemia. 2016 Jan;30(1):238-42. Association between habitual physical activity and brown adipose tissue activity in individuals undergoing PET-CT scan. Clin Endocrinol (Oxf). 2015 Jan;82(1):147-54. A review of PET normalization: striving for count rate uniformity. Nucl Med Commun. 2013 Nov;34(11):1033-45. A rare non-small cell lung cancer (18)F-FDG PET/CT study in a young patient with genetic anomaly living in a highly polluted area. Metastatic lesions not shown by CT. Hell J Nucl Med. 2013 May-Aug;16(2):144-5. The impact of FDG-PET/CT on the management of breast cancer patients with elevated tumor markers and negative or equivocal conventional imaging modalities. Nucl Med Commun. 2011 Feb;32(2):85-90.